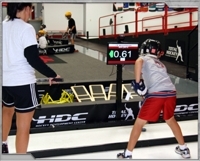 Our training facility welcomes hockey players of all ages and abilities. In fact, that's why xHPTF was created; to encourage all players in a fun, positive and challenging environment. We believe the combination of training technology, performance feedback, our coaches' training style and a positive environment lead to the development of "heart, drive and confidence" in each and every player. xHockey serves all players who want to improve their hockey skills. xHPTF primarily serves players from Lakeville and the surrounding communities of Prior Lake, Farmington, Bloomington, Apple Valley, Burnsville, Rosemount, Hastings, Faribault, Northfield, Owatonna, New Prague, Waseca, Le Sueur, St.Peter, Mankato and Rochester. However, we welcome players from hockey programs throughout the state and surrounding states. We will be offering numerous programs and leagues year-round to encourage continued development throughout and before the hockey season. Please check back to this site often to review upcoming programs and availability. Total Commitment: We are committed to offering the best hockey skills training program available. Total Professionalism: Our coaches and trainers are committed to the development of each player's heart, drive and confidence. Total Passion: All xHPTF personnel are passionate about the game of hockey and imparting that passion along to our players. Total Difference: We engage a training style and develop training programs to make a difference in the lives and skills of each player. Please install Adobe Flash and restart your browser to view video. Our 130' by 64' ice arena offers a smaller-than-standard rink design to intentionally speed up the game, improve response times and challenge each player to their full potential. Created by former NHL players, coaches, and trainers, the off-ice training of our program is the most advanced in the Twin Cities area. Training stations are each designed to build specific skills sets and offer the player immediate feedback to encourage improvement. Even more, our program utilizes an industry-leading database to benchmark each player's performance and improvement.